This is a great deal for essential oils on Amazon! Many of these oils are the very common ones that you will end up using very often! I used lavender, orange, and peppermint yesterday! 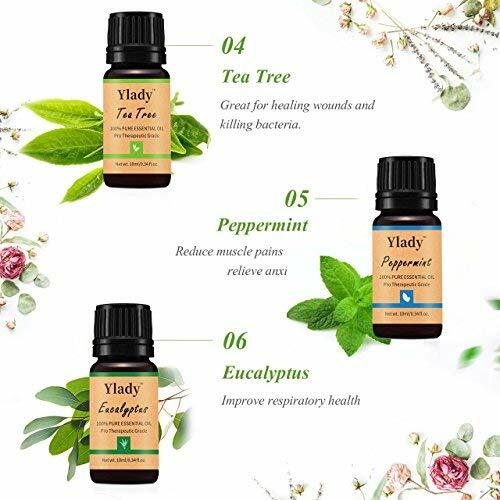 Hurry and get the Essential Oils Kit Ylady Therapeutic Grade Aromatherapy Essential Oils (Includes Lavender, Peppermint, Tea Tree, Eucalyptus, Orange, Lemon Grass Oil) today for only $19.98 as low as $6.47 from Amazon when you use promo code H9TSRRZV at checkout. (Limit 1.) Check out all of the recent Amazon deals here! Pure essential oils set includes Six 10 ml bottles of Therapeutic Grade organic essential oils (Lavender Oil, Peppermint Oil, Tea Tree Oil, Eucalyptus Oil, Orange Oil, Lemon Grass Oil). Easy to mix and match for blending or dilution purposes. Made from the aromatic essences of plants. Essential Oil Lavender: It is antibacterial, moisturizing, calming effect stimulates blood circulation, reduces anxiety and improves sleep, and alleviates headaches. Essential Oil Peppermint: It is antimicrobial, calming, provides pain relief, improves cognitive performance, and repels insects. Essential Oil Eucalyptus: It is also antibacterial, anti-fungal, and has antiseptic properties. It boosts the immune system. Use in a diffuser to kill airborne bacteria. Essential Oil Rosemary: Relieves stress, reduces pain. Diffuse to help with focus and mental fatigue, ideal for hair and skin care. Essential Oil Lemon: Antioxidant, anti-stress, antibacterial, refreshing. Ideal for skin,hair, nail care and effective way to clean around the house or office. Essential Oil Sweet Orange: It is a natural antidepressant, anti-inflammatory, and sedative. Sparks the immune system, blends well with most oils. Helps with acne prone skin, relaxes muscular and nervous spasm. Essential Oil Tea Tree: Use for its antibacterial and anti-inflammatory properties. Stimulates hair follicles and treats dandruff. It helps with bronchitis and sinus infections. Safety Warning: For external use only. Avoid contact with eyes, don’t let kids to swallow them. If pregnant, consult with your health care provider before use. Buy the Essential Oils Kit Ylady Therapeutic Grade Aromatherapy Essential Oils (Includes Lavender Peppermint Tea Tree Eucalyptus Orange Lemon Grass Oil) for Diffuser Massage Aromatherapy Skin & Hair Care from Amazon. Next articleDairy Queen’s FREE Cone Day!! !